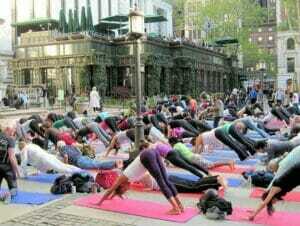 Free yoga in Bryant Park is a not only for yogis but for anyone who’d like to practise while in New York. There are many yoga schools and institutions but these yoga classes Tuesday mornings and Thursday evenings in Bryant Park are for free. 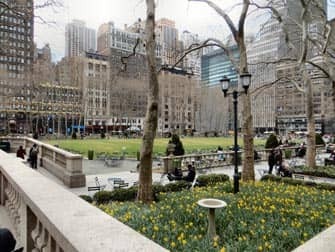 Bryant Park is just steps away from Times Square. This oasis of calm is the scene of many activities in the summer such as Yoga, Tai Chi, Film Festivals, fencing, chess and more. There is always free wireless internet available in the park. Classes in 2018 are held every Tuesday and Thursday, from May the 24th to September the 20th.